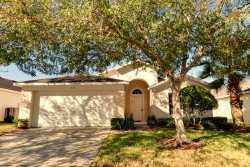 Enjoy your own 6 bedroom pool rental near Walt Disney World Resort and play golf at 3 major golf courses within 7 miles of your vacation home. Book Today! 4 Br private pool rental in Hampton Lakes, less than one mile from Highlands Reserve golf. Brand new Orlando area vacation home in one of the best locations in the area, Aviana Resort Orlando in Davenport. This 6-bedroom, 4.5 bathroom vacation rental sleeps up to 16. Your fun begins the minute you open the door! It includes benefits of the resort facilities like the clubhouse, fitness center, playground, zero entry pool, hot tub, sand volleyball court and use of the business office for computer access. The living room has 2 large and comfortable leather couches that have recliners at each end. Raise the armrests to find USB chargers for your devices! Just make sure the couch is plugged in. A separate rocker/recliner can be used to relax while watching the wall mounted 55” smart TV, as the ceiling fan cools you from above. The smart TV includes cable, internet, and multiple viewing options. There is an assortment of DVDs that can be watched on the Blue Ray/DVD player. The lift up coffee table is great to adjust for eating, using your laptop or playing games! The family room includes a relaxing 10’ couch and coffee table, and a computer table and printer you can connect to your laptop. Paper is also provided to print out things like boarding documents or directions to the airport. The kitchen has everything you need to cook and dine in, as well grill outdoors. Large countertops are throughout, as well as a dishwasher, stove, and refrigerator with ice and water dispenser. The open room concept blends the kitchen seamlessly into the living room. It includes a spacious island with a 3’ x 6’ granite countertop as well as a Bistro table and chairs by the patio doors. The formal dining table can easily accommodate up to twelve for those memorable nights. If informal dining is more your style, members can also chose to dine in the living room and kitchen while watching TV. This King bed master bedroom has a walk-in closet and a 55” smart TV equipped with cable, internet, and multiple viewing options. The ceiling fan will provide a gentle breeze to help you fall asleep. The en suite comes with a large soaker tub and a separate shower. This King bed master bedroom has walk-in closet, ceiling fan and a 55” smart TV equipped with cable, internet, and multiple viewing options. This bedroom also has its own private full bathroom. This bedroom has a twin over a full bunk bed with storage space below the full mattress and under the stairs, in addition to the spacious closet. A 43” smart TV can be easily watched from the bunk bed. The ceiling fan has been disabled to provide safety for the person on the top bunk. This bedroom comes with a queen sized bed, ceiling fan, dresser, a spacious closet and a 45” smart TV equipped with cable, internet, and multiple viewing options. This bedroom also comes with a queen sized bed, ceiling fan, a dresser, a spacious closet, and a 45” smart TV equipped with cable, internet, and multiple viewing options. This lovely bedroom comes with a day bed (twin mattress) another single bed with a trundle, and a 43” smart TV, ceiling fan, and a spacious closet. Wake up and be awesome! The loft area has a very comfortable futon with full mattress, a 37” smart TV, Blue Ray DVD player and a Play Station 4 with two controllers and video games. Additional DVDs and games are also available. In addition to the full baths in the King Master suites, there are two additional full bathrooms upstairs, and a half bath downstairs. Washer and dryer are on the first floor. The pool / spa area has a beautifully designed 18’ x 30’ pool with an elevated hot tub. This area also includes a five burner BBQ grill and outdoor patio table with 6 chairs. Enjoy relaxing on the comfortable outdoor patio furniture, take a dip in the pool or de-stress in the hot tub. Pool towels are on site as well! The game room includes a full-size (4’ x 8 ½’) Brunswick pool table with cover, and a side table. Note: The location also has a Pack ‘N Play Playard, stroller and highchair. We have a 7 day min stay for holidays. Please email us with your dates before you book if you are looking for less than 7 days to see if this home is available for the shorter stay. Please note that the standard web quote may not include fees for optional pool heating, spa use or grill use. If requested, there will be extra taxable charges: pool heating: $25/night, grill rental: $12 per day. For homes with a BBQ, guest is responsible to refill/exchange when needed.